Report shock: Indigenous community leader Sam Watson, The United Liberation Movement for West Papua’s Australia and Pacific countries ambassador Amatus Douw, Catholic Justice and Peace Commission executive officer Peter Ardnt and Senator Claire Moore. THE Catholic Justice and Peace Commission of Brisbane has called on the United Nations to investigate human rights abuses in West Papua. The commission has issued a report documenting recent military and police intimidation, beatings and torture, kidnapping and murder in West Papua. The report concluded there has been no improvement in human rights in West Papua after a Commission Shadow Human Rights Fact Finding Mission visited the Indonesian provinces of Papua and West Papua in February. On March 9, The Catholic Leader reported recent alleged cases of human rights abuse cited by the fact-finding mission members – Commission executive officer Peter Arndt, and respected human rights advocate Josephite Sister Susan Connelly. 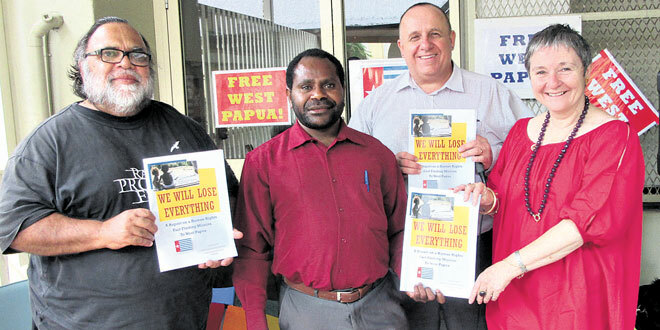 CJPC executive officer Peter Arndt has released a 24-page report on the fact-finding mission “We Will Lose Everything”, based on interviews with more than 250 community leaders in Jayapura, Merauke, Timika and Sorong. “We heard many stories of bashings, torture, murder, economic hardship, social marginalisation and cultural deprivation,” Mr Arndt said. Mr Arndt identified the instigators of alleged human rights violations as members of the Indonesian army including Kopassus, police including a special counter insurgency unit, Detachment 88, and Indonesia’s intelligence agency, BIN. The fact-finding team also heard and saw evidence of the rapid demographic shift in West Papua resulting from the influx of Indonesian migrants into West Papua. It heard evidence of growing marginalisation of Papuans economically, socially and culturally. Many Papuans met by the delegation expressed immense desperation at the combined effect of their violent repression and marginalisation. “An environment of great fear and desperation was clearly evident among the people,” My Arndt said. The fact finding mission also met with eyewitnesses of the 1969 “act of free choice” – a United Nations sanctioned vote given to 1022 Papuans to decide whether the former Dutch colony should be granted independence or become integrated into the Indonesian Republic. The evidence of one woman who took part in the vote supported the claim that the Indonesian security forces used violence and intimidation to obtain a unanimous vote of consent to become part of Indonesia. “She was threatened with dire consequences if she did not support the Indonesian takeover,” the report said. “She still showed great distress and guilt over her part in the vote all these years later. “She sees her support for the Indonesian occupation as a betrayal of her people’s wishes. “Worse still she cannot publicly share what happened for fear of what that might mean for her own life and the life of her family. The CJPC report called for action at the United Nations to investigate human rights abuses, and for the Indonesian Government to negotiate with the United Liberation Movement for West Papua to find a pathway towards self determination. Last week Mr Arndt travelled to Port Vila, Vanuatu to submit his findings to members of the Melanesia Spearhead Group, an intergovernmental organisation composed of four Melanesian states – Fiji, Papua New Guinea, Solomon Islands and Vanuatu. Indonesia is a member of the group and the ULM has observer status. There has also been an upsurge in arrests and detention in West Papua, following demonstrations marking the anniversary of transferal of administration in the former Dutch New Guinea to Indonesia in 1963.